To Sum It Up: Liberty Connor has returned to Blackbrooke to try and save her town from being destroyed not only by the Crits but by a human threat as well. Liberty’s odds of even surviving long in Blackbrooke, where the Rules no longer apply and the Crits terrorize the residents day and night, are slim, but she’s determined to fight until the end. She’ll have to put aside whatever feelings she still has for Cassius Godwin, whom she’s known since childhood but who now leads the Crits on a mission to obliterate Blackbrooke. Lee's Review: With Halloween right around the corner, now is the perfect time for a scare-tastic read like Blackbrooke III: King of Queens. I’m also feeling a bit sentimental about the book, as it’s the last chapter in a series about a small English town where the absolutely terrifying creatures known as Crits menace the residents, essentially keeping the humans prisoner within Blackbrooke’s borders. It’s been a thrilling ride across three novels, and King of Queens concludes the trilogy with a strong finish. Being the hopeless wimp that I am, I don’t typically gravitate towards books with a high scare factor, but I’ve very much enjoyed this series. The Crits are grotesque as hell, but that’s been the fun of reading about them. You don’t get too far into King of Queens before you’re reminded of how vicious they are and how much they love to snack on humans. You also spend a good deal of the book waiting for them to strike yet again and horrified when they do. The suspense and pacing of the action are so spot-on here. A constant feeling of unease hangs in the air while reading this because you never know what the Crits and their human leader, Cassius, are going to do next. Cassius, once teased mercilessly as a child by the other Blackbrooke kids, now wields the upper hand as the only person who holds the closest thing to control over the Crits. He and his “army” engage in a chilling game of cat and mouse with Blackbrooke’s residents. All the while, though, he seems to have a cryptic, alternate agenda on his mind, too. Working out exactly what Cassius’s endgame is adds even more mystery to an already taut story. I love how the axe has become protagonist Liberty’s favorite weapon. With her axe in hand, there’s no stopping her, not even the pleas of her friends to not venture out on her own to face Cassius and the Crits. That’s why Liberty finds herself back in Blackbrooke, though, and once she sets her mind to a task, there’s no second guessing for her. Watching the development of this story and these characters has been awesome. Even during the occasional moments when I wanted to cover my eyes, I didn’t because that would have meant turning away from the page. Although the ending of King of Queens couldn’t have been written any more perfectly, I think it’d be cool to eventually have a follow-up, even just a novella, to check in once more on Liberty and her companions. All in All: If you’re looking for a pre-Halloween fright, then you need to start this series. I became more invested with each book I read, and Blackbrooke III: King of Queens was a very satisfying series finale. Ally's Review: The much anticipated Blackbrooke III: King of Queens did not disappoint! It felt so energizing to be back in Blackbrooke, especially since the last book left off with a terrible (and when I say terrible, I mean that in the best way possible) cliffhanger. I easily got caught up in all the wonderful action and managed to finish the entire book in one night. 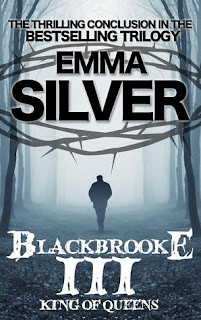 With every installment in the Blackbrooke series comes the promise of action and horror, which is one of the main aspects that I love about the books. This particular book is, in my opinion, the scariest. I made the mistake of starting the book at night time and I was flipping out whenever any of the Crits, especially the Queens, made an appearance. Instead of getting used to the Crits and their violence towards the humans, I was more horrified than ever. And I loved it. It's incredibly hard to find a good book that can actually scare you as a reader. 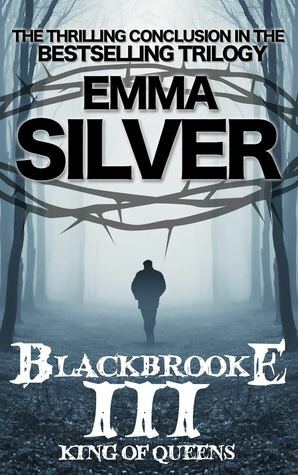 I admire Blackbrooke for its ability to terrify me and I patiently await the day when I can find another series to compete with it. Along with the horror, there is plenty of action. All of the characters are such badasses! If I could describe King of Queens in just one word it would be badass. There was not one dull moment in the whole entire book. The story is fast-paced and it flowed perfectly. I was thankful that I didn't have to wait too long for some of the confrontations because the suspense was killing me. The characters are yet another reason to love this series. I am so proud of Liberty, the main female character. Throughout the series, she has grown into a remarkably strong woman, and I love the fact that she doesn't sit around and let others do the work for her. Her relationship with Cassius had me on edge throughout the entire book. Cassius turning "evil" wrecked me. At first, I welcomed it, thinking that it would be an interesting twist to the story, but I soon missed the old Cass. It's weird, because in the previous books I had a hard time connecting to him and I honestly couldn't care less about his character. But something about him being evil changed my perspective. It is very difficult and slightly depressing to read about him and Libby being on opposing sides. My favorite character is and always will be Denzil. Denzil is so wonderfully humorous; he brings rays of sunshine into the otherwise dark and scary town of Blackbrooke. I felt that he also grew up a lot this time around, and I credit him for keeping the gang together. The only aspect of the book that I did not enjoy was the fact that I felt like while some of the characters (Libby) were figuring stuff out, I was still left in the dark. Normally, mysteries do not bother me, seeing that I enjoy puzzling them out. The problem was that I felt like the mystery was solved but the answers weren't clearly stated. I had to do a lot of guesswork when it came to figuring out what had happened and what was going on. The ending. Oh my God, the ending is so ridiculously beautiful, I couldn't help but laugh. Everything fell perfectly in place, and I couldn't have asked for anything more. All of the characters got exactly what they deserved. It was just a perfect ending to the series. I have enough closure to move on with my life but I am still invested enough to want to know what happens next. Hopefully, this won't be the last time I see Libby and the gang. All in All: King of Queens is a brilliant addition to an amazing series. Everything, ranging from the horror to the plot, is on point. I loved every single action-packed moment and I couldn't be happier with how things were left off. An axe wielding heroine, I like and The Crits? Sounds creepy! You girls dressing up this Halloween? I think Ally and Melissa are making plans to. I'll just eat a lot of Reese's Peanut Butter pumpkins to celebrate the day, lol.